This is the first of these entries that requires more significant editing. I admit that when a character never showed up in my previous campaigns I saw no reason to change the name or provide a different story. The same can’t be said for Aeëtes. He played a large role in the events over the past forty years in Cimmeria and he also died. 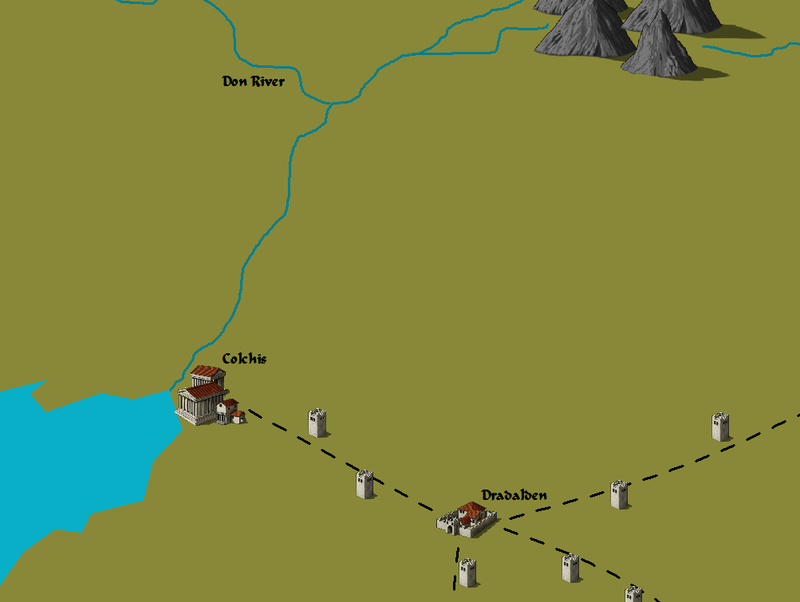 I needed to detail the more recent history of Colchis which will become relevant in my campaign soon. I also needed to remove the references to Aeëtes that used the present tense. Additionally, there are a few words and mythical characters that you might not be familiar with in this post. Rather than define them here, I’ve added links to appropriate webpages with additional information if you wish to access it. Colchis is the famed holy city where Jason ventured to find the Golden Fleece. Before the Trojan War the city was ruled by King Aeëtes and the same king continued to rule into the new age. After having his city’s prized possession stolen from him he panicked and immediately sought out a way to extend his natural life. He found his answer in undeath. Aeëtes forced the city magician to transform him into a Curst. With eternity on his side, Aeëtes studied as many magical tomes as he could get his hands on in order to increase his inhumane might. He later had his eternal power increased by having himself spell-stitched. This unholy process didn’t go without attracting some attention from Hades, Lord of the Underworld. Every mortal who becomes an immortal has effectively escaped Erebos and Hades doesn’t like losing any of his citizens, especially kings. Hades put a bounty on King Aeëtes. Hundreds of Marut inevitables, demons, devils, bounty hunters, and hopeful heroes swarmed to Colchis in the wake of the Trojan War. They all failed and died due to Colchis Castle’s excellent defenses and the intervention of Demeter who stepped in to save Aeëtes due to her old grudge with Hades. Some of the warriors were captured and made to serve King Aeëtes through magical charming, bribing, or in the case of the inevitables, reprogramming. The other creatures have since died out, but the inevitables survived the centuries. Aeëtes even made more inevitables to increase their numbers. While Aeëtes lived Hades sent another army to attack the city every blood moon. Aeëtes fought off all of these attacks but he could not defend against the Seven Rages of Jevaninada the First. The Seven came to Colchis and subdued Aeëtes. They forced him to undergo a permanent quest spell that bound him to serve King Jevaninada the First. This enchantment was broken by Amalgami and Salzar during the First Alliance War. Aeëtes engaged the Rage, Grave, during the uprising and lost his soul in the conflict. With his soul imprisoned in Grave’s ruby dagger, Aeëtes could not return to life as he once did. Some say that Grave bartered the soul to Hades, but others say that the soul still resides in the ruby dagger, now lost after the death of Grave. At the conclusion of the First Alliance War, Queen Anajakaze put ruling ladies in control throughout the realm, replacing existing lords or absent lords such as King Aeëtes. In Colchis she installed Lady Shunawo Ka, the sorceress, as the city’s ruler. Shunawo is one of the few ladies to survive the purge that King Jevaninada II instigated upon taking power. She married the King’s friend, Wulang, adopting his surname, Li. As Wulang often went away on eforcer missions, Lady Li continued to rule in his absence. She keeps control in Colchis Castle to this day, even with Wulang missing and presumed dead in Bigby’s Forest. Colchis Castle has long been known for its amazing defensive capability. The castle is a built on a solitary hill in the middle of the city. The Don River has been rerouted to flow around both sides of this hill creating a natural moat. A large clutch of about thirty Tojanida were persuaded by Aeëtes to live in the moat. They prevent anybody from swimming across in exchange for food and gold from the ruler of Colchis, now Lady Li. The Castle itself is an extradimensional space much bigger than it would normally be. There is space enough for the 65,000 people of Colchis to fit along with the food and water necessary to sustain them for four months. Every single one of the statues in the Castle animates upon intrusion and seeks out the trespasser. A guards and wards spell is also in effect for when the castle is under attack with the added effect of a suggestion over every significant entrance to join forces with the good and just Lady Li and receive great rewards. There are numerous other traps within Colchis Castle to prevent an army from ever reaching the basement where the population of the city waits during an attack. There are even rumors that the ancient sleepless dragon that Medea defeated is still somewhere within the citadel with an army of its Spartoi waiting at Lady Li’s command. Colchis is practically a Greek city and thus the typical Colchian diet is also practically Greek. The farms in Colchis are especially plentiful because of Demeter’s help. They provide onions, wheat, olives, grapes, and goats for the people to eat and plenty left to export and earn money for the city’s defense against Hades. Some of the best wine in The Magical Lands comes from Colchis. The Colchians also consume fish and urchins that are taken from the Black Sea. Colchis has a small navy that can contend with any of the other tiny fleets on the Black Sea. They need fear no invasion from the Mediterranean due to the Symplegades. A huge temple to Demeter was built after Aeëtes received her help in the first invasion of Hades. The temple walls are made of magically hardened glass that helps the indoor jungle plants grow. A special breed of faeries was made by Prometheus in exchange for a favor from Aeëtes at a later time. These faeries, dubbed Washernias, fly around on small water jets that keep the plants inside the temple hydrated. At the end of the temple away from the huge glass doors is a thirty foot high statue of Demeter standing with her arms spread out to the sides. In her left hand she holds a shaft of wheat and in her right, an apple. A smaller statue of Persephone rises to her navel. A large basin is carved into the floor at the statues’ feet for sacrifices to be offered into. A large tomb to Aeëtes’s only son, Absyrtus, exists in the market district of Colchis. The custom of touching one’s hand to the lips and then to the heart as one passes the shrine has continued even after Aeëtes’s death. The interior of the tomb is open to those who wish to see the gold, jewels, treasure, and body contained within. The valuables are cursed and cannot be removed from the tomb. When the tomb was first opened many thieves tried to steal the items only to dissolve into putrid liquid as they exited the tomb. The corpse of Absyrtus was magically put back together after Medea eviscerated it and is now preserved with a magical effect emanating from the tomb itself. On the anniversary of Absyrtus’s death a day of the dead is held which includes a solemn parade that terminates at the tomb’s threshold. It is not clear to the public why Aeëtes did not bring his favorite child back from the dead. Legend says that he attempted a resurrection that the soul of Absyrtus refused. The citizens of Colchis believe the corpse is animated and is simply under orders to remain in repose at the tomb until some mysterious event has passed. If this is true then Absyrtus would be an extremely powerful being after having nothing to do but gather his power over the centuries. Colchis is a melting pot for the people of The Magical Lands and those of Greece. It attracts tourists from both sides to enjoy its mixed culture. The city also brings in many religious tourists due to the monuments built to the many heroes who passed through the city on the Argo. A strange effect has been noticed by those who visit Colchis. Whenever Lord Aeëtes or a Dragovinian pass by one of the fifty-two statues to the Argonauts, the statue’s eyes glow an eerie green. No one is sure why this happens, but some believe it to be due to the immortal nature of Aeëtes and the Dragovinians. This has infuriated Hades but his hands are tied by the blood moon restriction on his attacks on Colchis. The city has many places to stay for tourists, travelers, pilgrims, and merchants. By far the most popular boarding house for adventurers is the Broken Wagon. The first room of the Broken Wagon was built from discarded wagon parts deemed unsalvagable by Colchian wainwrights. That room now serves as the entryway to a far larger structure. The Wagon is owned by the Nima family. The current owner, Dreyus Nima, is the descendant of the original builder, Gestor Nima. Dreyus was an adventurer for a time during his youth, but stopped after losing his hand. He has since regenerated the hand, but the fear of losing it again dampens his thirst for excitement. He loves to hear the tales of other adventurers and vicariously experience their thrills. The rough and tumble appearance of the Broken Wagon provided the attraction for adventurers initially and now more and more come due to the network effect. Jobs a plenty can be found at the Wagon, bounties are collected at the Wagon, magical items are identified and traded at the Wagon, and everyone has a story to tell at the Wagon.